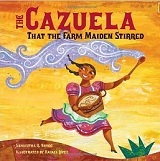 The Cazuela That the Farm Maiden Stirred riffs off the idea of “The House That Jack Built” with a cumulative story of making rice pudding, arroz con leche. This one, however, adds the innovative idea of introducing the items and animals in English, but then once you know what they are, using the Spanish words in later recitations. Don’t worry! They do get their delicious dish, and the recipe is provided at the back of the book (as well as a glossary and pronunciation guide). Holiday House, New York, 2011. 213 pages. Full disclosure: Angela Cerrito is my friend, and was a member of the Writer’s Critique Group I was in at Sembach Base Library in Germany. In fact, I was very happy on the last page of the book to discover acknowledgements that included my name and our other friends from the writer’s group, and even my dear co-worker at the library, Elfriede Moehlenbrock. (And then I remembered that Angela had asked me how to spell her name — but it takes a long time after writing the acknowledgements for the book to actually appear in print.) I don’t think I actually helped with this particular book, but like Angela, I am sure that when I get published some day, I will need to thank the many writers who critiqued and encouraged me along the way. “If you kill someone, you are a piece of murdering scum. When I saw his body all twisted and still, I knew . . . I knew my life was worthless. It didn’t matter what Dad said or how hard Mom cried. There was nothing they could do. Then, as the book begins, Robbie says, “They call this place Great Oaks School, but it must be a prison.” Normally, I’d think a kid was exaggerating if they said that, but Robbie definitely has a point. A school official, Mr. Lester, comes in and tells Robbie to make a list telling who he is. When Robbie’s list doesn’t come up to Mr. Lester’s standards, Robbie doesn’t get any food. Then the next short chapter takes us back in time to River Falls, the day Ryan, the new kid, showed up. He spent the first day actually under the desk next to Robbie. And then he followed Robbie home and ate dinner with his family. The chapters alternate between Robbie’s time in Great Oaks School or Prison with chapters about Robbie’s normal life in River Falls. Great Oaks is the end of the line — the school that will take kids no one else wants to deal with. So what happened to get Robbie to this point? Angela Cerrito does a masterful job of weaving the two stories together. Mr. Lester wants Robbie to talk with the other kids at Great Oaks about what happened, and Robbie doesn’t want to. Meanwhile, Robbie has what seems like a pretty normal life. Sure, Ryan does some strange things, but the more Robbie gets to know him, the more understandable it seems. And Ryan is great with Robbie’s mom’s daycare kids. And he even gets some of their classmates to come to Robbie’s races. In some ways, I was sorry I read this one so close to Okay for Now, by Gary B. Schmidt, because the two books felt very much alike. But instead of being historical, instead of having a close relative injured in the Vietnam War, Robbie has a close relative injured in the Iraq War, which feels much more immediate. Both books have a horribly unfair teacher, (So unfair, it makes me wonder if Angela drew him from life — because that particular unfair bias just seems too bizarre to be anything but real!) but in The End of the Line, that teacher never does come around. Another difference is that in Okay for Now, we know what Doug Swieteck’s up against right from the start. We — along with the whole town — expect him to be a delinquent. In The End of the Line, Robbie seems like a great kid. What in the world happened to get him in this mess? Did he really murder someone? And why? As the book goes on, we feel like we understand more and more the anger and despair that are eating at Robbie. I do love Angela’s website, which dovetails nicely with the book. Since writing lists becomes important for Robbie, Angela offers readers a chance to submit their own lists. Who are you? Answer with a list. Henry Holt and Company, New York, 2011. 34 pages. This book works both as a collection of short, accessible poems and as an entertaining picture book. The author’s note at the beginning informs us that technically the poems inside are senryu, not haiku. But the syllable format is the same, and I think it was a good choice to use “Haiku” in the title, since that is a term most school children are familiar with. This book takes us from a cat in a pet store waiting to be bought to a cat in a home with his very own beloved boy. The illustrations show a true cat nature, and so do the poems. Wait — let me back in! Definitely charming. Reading this to a small child will prompt them to look at a cat with new eyes. Reading it to an older child may get them writing haiku of their own. Chalk is a wordless picture book. The pictures are photorealistic, and at first glance you think they’re done by a computer, but a note at the back says Bill Thomson hand-painted all the pictures, which makes the book all the more amazing. The story is simple, but a knock-out winner. Three children (of three different ethnicities) come to a playground on a rainy day. They find a bag hanging on a bouncy dinosaur ride. The bag contains some sidewalk chalk. The first girl draws a sun shining — and immediately the rain stops and the sun comes out. The second girl draws butterflies, which pop off the pavement and fly away. You really need to check out or buy this book for yourself and see the pictures yourself. The story is compelling by itself, but the pictures make it brilliant. I don’t think any two pictures are painted from the same perspective. The unique angles on the action, the looks on the children’s faces — so many things make this a book you can read over and over and discover new details each time. Delacorte Press, New York, 2011. 399 pages. Hooray! Flavia de Luce is back in this, her third mystery and adventure. She bikes around the family’s estate and nearby village in England on a bicycle named Gladys, and manages to find all sorts of trouble. The book begins with Flavia accidentally burning the tent of a Gypsy who tells her fortune. The next morning, Flavia discovers the Gypsy has been bludgeoned, and Flavia summons help — but not before she gets a good look at the evidence. “He had already reached the far side of the bridge before he turned back. ‘There’s a blanket in the boot,’ he said, and then vanished in the shadows. “I felt my temper rising. Here was this man — a man in an ordinary business suit, without so much as a badge on his shoulder — dismissing me from the scene of a crime that I had come to think of as my own. After all, hadn’t I been the first to discover it? “Had Marie Curie been dismissed after discovering polonium? Or radium? Had someone told her to run along? “A crime scene, of course, wasn’t exactly an atom-shattering discovery, but the Inspector might at least have said ‘Thank you.’ After all, hadn’t the attack upon the Gypsy taken place within the grounds of Buckshaw, my ancestral home? Hadn’t her life likely been saved by my horseback expedition into the night to summon help? “‘Go and sit in the car,’ Inspector Hewitt had said, and now — as I realized with a sinking feeling that the law doesn’t know the meaning of the word ‘gratitude’ — I felt my fingers curling slowly into involuntary fists. In this adventure, another murder follows, and past secrets surface. Flavia still is obsessed with chemicals and poisons, and in this book she actually finds a friend near her own age. The best thing about Flavia de Luce is that I am confident that the Inspector’s worst fears will come true: She will not be able to stay out of further trouble. I hear that the next book is coming out this Fall! Listening Library, 2010. 6 CDs. 6 hours, 41 minutes. I already reviewed the print form of White Cat, but listening to the audiobook was the perfect way to refresh my memory of what happened in the first book before I got a chance to read the sequel, Red Glove. My review still stands — this is an impressively plotted, suspenseful, and fascinating book — but I want to add a couple comments about the audiobook. First, like so many books with a first-person narrator, this book is perfect for the audio form. Jesse Eisenberg gives Cassel a voice that sounds completely authentic. He’s a teenage guy trying to fit in, but he’s also the only non-curseworker in a family of curseworkers, a kid who’s been trained in the con since he was small, and someone who thinks he killed the girl he loves. Second, I’d almost forgotten how good this book is! Even though I’d read it before, I was completely absorbed with the story, not wanting to shut off the audio when I arrived at work. I also found that, like Megan Whalen Turner’s writings, this book is even better the second time around. Because hints are dropped that you don’t appreciate or notice the first time. You do know that Cassel is working on a con at the end, but when you reread it, you realize all the little things he is doing in preparation. One of the lines I appreciated more the second time was something like: “I’m the best kind of thief, who leaves something of equal value.” I don’t think it’s a spoiler to point out that line, but you do enjoy it more after you know what Cassel’s talking about. Another good thing about an audiobook is that it slows me down. This particular book is too hard to stop reading once you start, so it was one of the many that kept me from a good night’s sleep. When I listen to the audiobook, I have to spread it out over many more days, which means I can live in that world longer and notice more details of Holly Black’s genius. If you haven’t started this trilogy yet, there are now two books out, ready to devour. May the third book come soon! You are currently browsing the Sonderbooks blog archives for May, 2011.